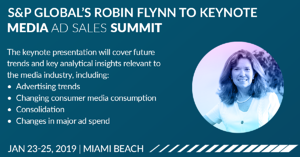 PITTSBURGH, PA – January 17, 2019 - Matrix Solutions, the only global ad sales platform built for media, announced S&P Global Market Intelligence’s Robin Flynn will deliver keynote at the 2019 Media Ad Sales Summit. Ms. Flynn, a Senior Research Director for data, research and insights division within S&P Global will share future trends and key analytical insights relevant to the media industry. The Summit, happening January 23-25, 2019 at the Nobu Hotel in Miami Beach, FL will bring together media sellers and buyers from across the industry to discuss convergence, programmatic, automating the ad/buy process, and more. Ms. Flynn’s keynote session, taking place Thursday January 24th at 9:10 AM, will serve as the official kick-off for all Summit sessions. Ms. Flynn possesses over 30 years of experience in analyzing broadcast media and cable TV. In her role as Senior Research Director she oversees research activities for media communications, metals & mining, FinTech, financials/insurance, energy, and LCD. She is also Senior Research Analyst for Kagan Research, contributing analytical commentary to the Market Intelligence platform. She has served in a consulting capacity for various litigations and provided valuation testimony and trial exhibits, as well as delivering dozens of broadcast valuations and consulting reports. Ms. Flynn regularly serves as moderator and panelist at media conferences and industry events. Her expertise has made Ms. Flynn a frequently quoted analyst in trade publications as well as such national press.